Happy Birthday to our great nephew Jay who is 8 years old today. We wish you a wonderful day. This is Jays card . The inside holds a pack of coloured pencils and several sheets of his favourite characters to colour. I have added Spellbinders die cuts to the top of each panel and a Grand Calibur Decorative Oval to the inside back panel to enclose a butterfly which I have added to the page. I have used a square card, added layers of Couture Creations Vintage Rose Papers to the front and inside cover and plain card to the inside back. I then folded the front down and added flowers to the back of the card . After painting the base canvas I added bits and pieces of patterned paper to create a patchwork effect. I added a piece of lace I have ha din my stash forever and a pearl and rhinestone flourish and a Prima doll stamp. I hope you have enjoyed my blog this week. Thank you for visiting. Today I would like to share a sweet little canvas with you. 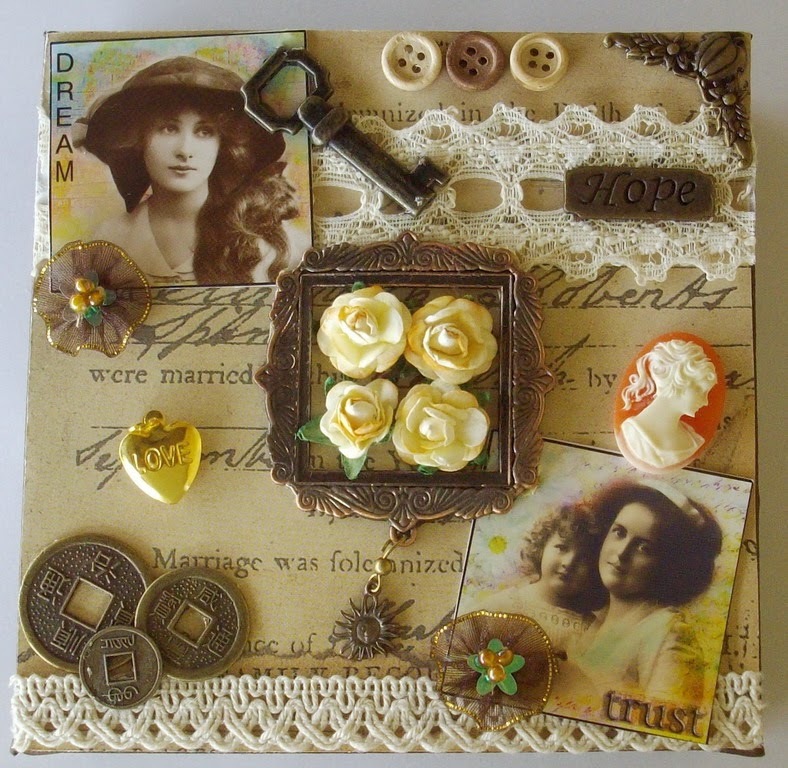 It is quite small ..6x6 ...and is embellished with lots of vintage bits and bobs. Another of the Couture Creations Vintage Rose Collection Dies today. This one is named Vintage Branch and I have added a Creatables bird die to complete the card. Thank you for visiting my page this week. 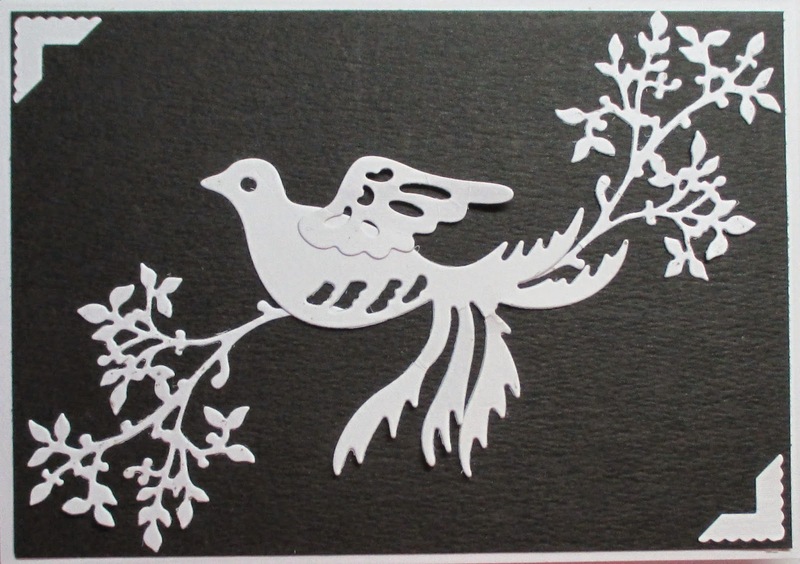 I was given a beautiful Dovecraft 3D pad for Christmas and have made up a few cards using some of the lovely images. I have used a 6x6 square card added an embossed layer of card, a paper doily, the 3D image which I have backed with linen card and finished with a cute little hat. I purchased this Scrapmatts frame at a craft fair last year and decided to make it up as a surprise gift for my hubby. I have used paper from my stash, rhinestone flourishes and paper flourishes and flowers. I used a chipboard phrase to finish the frame. Today's card has been made using the new Couture Creations Vintage Rose Papers . I have used a square card layered with Vintage Rose panels , a paper doily, a flourish die cut, lace trim and paper flowers. I finished it with a quote form the paper pad. Thank you for visiting my blog this week. I hope you have enjoyed it . A fairly simple sketch for this months Christmas All Year Round Sketch Challenge. I have used Graphic 45 papers for the patterned paper and greeting and stickers from Sticker Store. Time for the Craft Mad Sketch Challenge for March. Another year that seems to be flying by. This is my sample card for the sketch challenge. I have used Graphic 45 French Country papers, a paper doily and flowers.